Is this the phablet for you? We all knew it was coming. 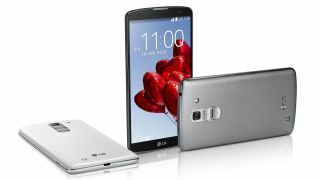 Hell, even LG had revealed details of its upcoming phablet on its own website, but now the LG G Pro 2 has now been officially launched. The LG G Pro 2 succeeds last year's G Pro, bringing with it a larger 5.9-inch full HD display (1920 x 1080), the same 2.26GHz quad-core processor you'll find in the LG G2, 3GB of RAM, 16GB/32GB of storage and the addition of a microSD slot. These specs put the G Pro 2 up there with the top phablets around, and the likes of the Galaxy Note 3, One Max and Xperia Z Ultra now have a new contender to worry about. Round the back the G Pro 2 sports a 13MP camera with OIS+ technology, and LG has stuffed in some nifty tricks for you to enjoy. You'll be able to record video as 120fps, allowing for one-half slow motion, one-fourth slow motion and original speed playback, plus there's the option to record in Ultra HD, 4K - much like the Galaxy Note 3. The G Pro 2 also features "magic focus", allowing you to choose the depth of focus after you've taken an image - something we saw Qualcomm show off during its Uplinq conference in 2013. Jumping on the selfie bandwagon the G Pro 2 uses less of the screen to show your ugly mug when in front camera (2.1MP lens) mode, providing a white glow to bring out all your best features. LG has further developed its "Knock on" screen wake function, with the G Pro 2 allowing you to tap out a little sequence to unlock your handset. There's good news when it comes to the operating system with the latest flavor of Google's platform on board - Android 4.4 KitKat - and of course LG has overlaid this with its own UI. A 3200mAh is in charge of keeping you going throughout the day, while 4G, Wi-Fi, Bluetooth 4.0 and NFC will keep you connected. Unfortunately though the press release states that the G Pro 2 has only been introduced to the Korean market, while "availability of G Pro 2 in markets outside of Korea has not yet been determined." The handset will be at MWC 2014 however, and so too will TechRadar, so keep an eye out for our hands on LG G Pro 2 review in the coming weeks.